Two words in the English language will keep your RV in the best condition possible: preventive maintenance. A host of annual RV tasks are sometimes a chore but they’re usually not too difficult or time consuming. One of the easiest jobs is taking time to seal RV seams with Dicor RV Lap Sealant. Is it time to re-seal your RV seams? 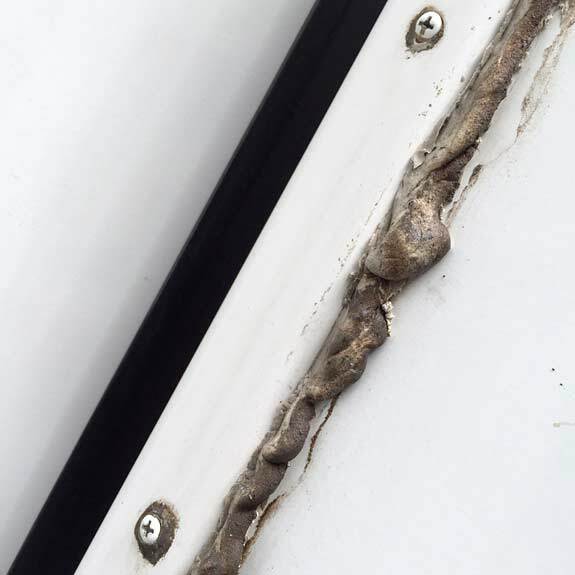 Sealing RV seams is important because water damage often happens at the corners where RV walls are joined together. Although RV walls leave the factory with sealant already applied to the seams, over time UV light and weather breaks the sealant down. This creates gaps in the corners which allow moisture to get inside. If that happens, the RV becomes a victim of fiberglass RV delamination, an unattractive defect that is impossible to fix and takes every ounce of resale value out of the unit. 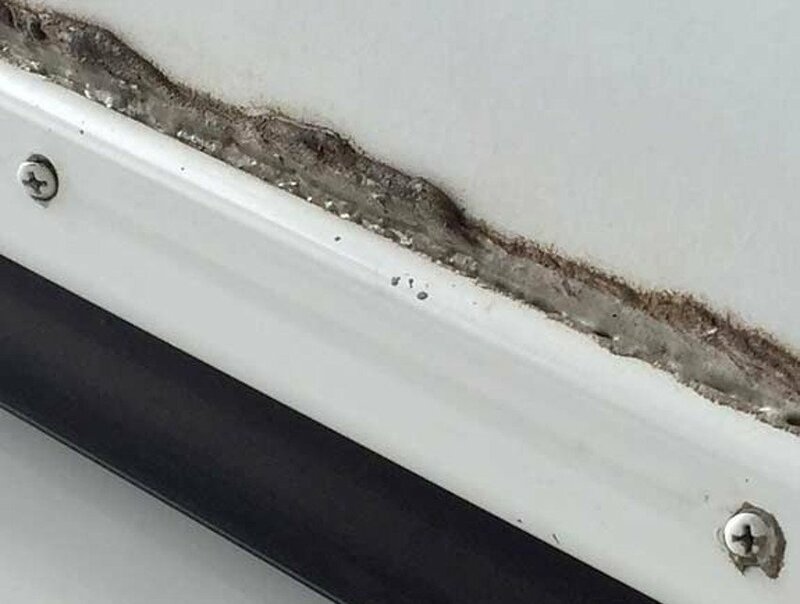 The good news is that you can protect your RV from this problem if you take annual measures to re-seal the exterior seams on your walls and roof seams with Dicor Lap Sealant. But don’t head to your nearest RV repair shop to get the job done. This task is so simple, anyone can do it. Why use Dicor instead of caulk? Don’t reach for silicone caulk to seal your exterior seams. Although this material is waterproof, over time it dries to a hard finish and cracks. Removing it is difficult and messy. Dicor Lap Sealant, on the other hand, never hardens even after years of ultraviolet light exposure. This seam sealing product remains flexible and water-tight over time. The only disadvantage with Dicor is that it can get ugly and dirty. Also, after many years it has a tendency to shrink and separate. That’s OK though, nothing’s perfect. Frequently inspecting all exterior seams at roof, walls, trim, vents, and light fixtures will prevent any problems resulting from Dicor’s weaknesses. Many RVs leave the lot with messy Dicor already applied to the fiberglass wall seams. Don’t worry if yours is one of them. Use self-leveling Dicor to avoid this look. Once you are fed up with the droopy looking brown goop on your rig, all you need is some extra time to remove the old sealant and replace it with the right stuff. Caulking tools or some sort of dull plastic blade make it easy to remove the bulk of old Dicor. Use a rag or sponge and some alcohol to get rid of remaining residue. 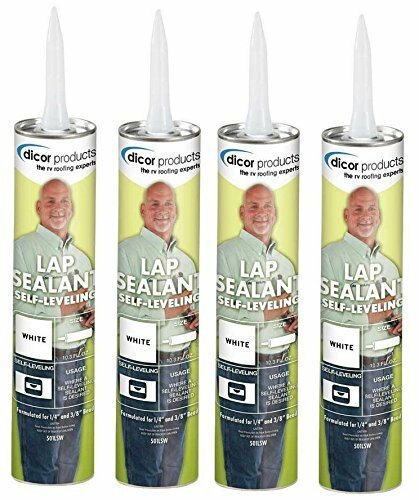 Don’t start the job without purchasing the right type of lap sealant. Dicor is the most popular brand name. Self Leveling Dicor is more fluid. It’s best used on the roof or flat surfaces where even spreading of the sealant is desired. Non Leveling Dicor doesn’t sag as much. It’s best for applying to trim on vertical surfaces. Make sure you have an adequate supply ready for your job. For our 27-foot RV we used four tubes to complete the chore. Larger RVs require more Dicor. You may also want to keep some handy for emergency repairs. Use a steady hand with a 3/8″± bead of sealant then apply long, smooth strips one at a time. Do not try to smooth out the sealant with your finger, as you might when applying caulk. Dicor is very sticky before it dries and will make a mess on your hand. 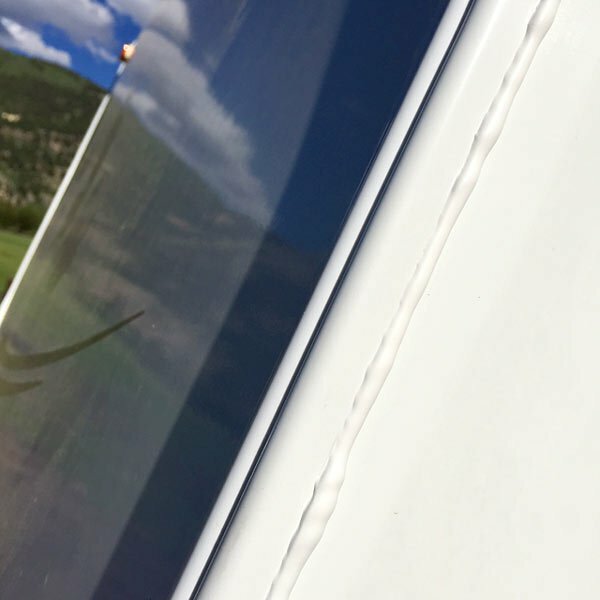 Resealing the trim on your RV is a time consuming job, but the reward is a clean looking rig with far less potential for expensive water damage and delamination. Puttingblue paint tape on the edge ot the area to apply the Dicor makes it look like a seal from the factory after you remove the tape. Do not wait too long to remove it as the tape will not be come off in a whole. I learned long ago that the best way to get an even seal is to use fineline tape from your local NAPA. you can smooth the seam out using rubber gloves dipped in the solvent for the sealant you are using. Quad caulking works great. Never hardens. Many colors. Uerathane. Use rubber gloves and smear it smooth after applying. How long does it last Jeff and would you choose it over dicor now, or whats your reason for using quad caulk? I never would have thought of the tape trick. Great idea! I’m a former RV engineer…..Your picture appears to be a buytl eruption. Butyl tape is the big ‘dirt magnet’, It is used under the lip of the fixture creating the lap joint. The Dircor sealant is the ‘cap’ to the lap joint. The butyl NEVER dries NOR ‘SKIMS-OVER’ so if it is exposed, every bit of dirt clings. The butyl also ‘creeps’ meaning it slowly oozes out as long as there is pressure. If you are one who checks and tightens the screws on your windows, you will find the butly ooze out as a result of the increased pressure. The key to a clean joint is to clean off all of the butyl that squeezes out before you apply your lap sealant.